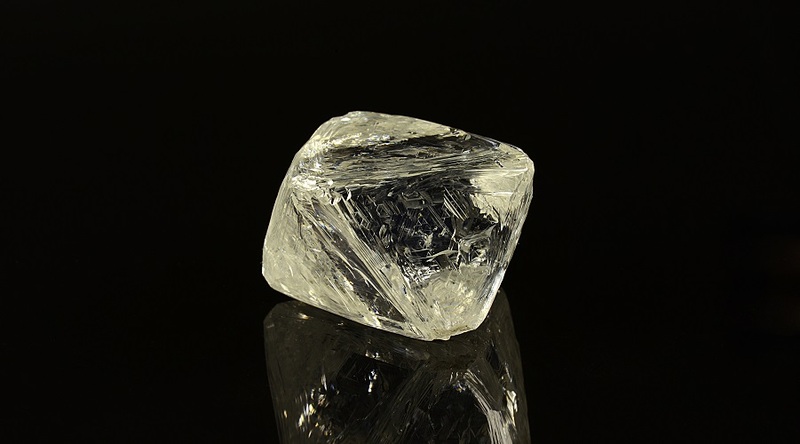 98.63 carats diamond. Photo by Alrosa. The world's largest diamond producer by output, Alrosa (MCX:ALRS), announced today the recovery of a large gem-quality diamond of 98.63 carats from its historic Jubilee (Yubileynaya) pipe, located in the eastern Republic of Yakutia. The octahedron crystal has inclusions of olivine, graphite and sulphide, is transparent yellow-tinted and measures 28.96 х 28.03 х 27.30 mm. "According to our information, more than twenty large rough diamonds over 50 carats have been extracted from Jubilee since the beginning of 2017. We are waiting for the new stone to be delivered to USO for a detailed examination and valuation," the Director of the United Selling Organization Alrosa, Evgeny Agureev, said in a media statement. Given that large stones tend to receive unique names, diamond fans are impatiently waiting to see how the new yellowish gem is going to be baptized. Earlier this year, a 51.91-carat rough diamond from Jubilee was named "Russian Ambassador Andrey Karlov". Half of the world’s rough diamonds come from Anglo American’s De Beers and Alrosa mines.